Hi, for current release, there is no updates for 0.974 RC3. The old ones for RC2 are already in RC3. Right now this thread is reserved for future updates. If you find any errors in the catalogs you can post them here or in the catalog fixes thread. But don't get obsessed in things like distance. For example somebody mention to change the distance in Alnitak, if you look at the wiki the distance is 387 pc but with and error of +- 54 pc! Something normal because Alnitak is so far away that the error parallax data of hipparcos at those distances is really big. Resuming, with distances too big don't get obsessed with the precision, also you have to know that changing and distance data most probably will also change all semi major axis data and period involving the star system because most of them are based in apparent separations. But of course if you find any absurd distances data report it. Any other things that improve the data in the catalogs like more precision in the coordinates or coordinates with the true barycenter of the system (yes, a lot of them are just the coordinates of the brighter component I have already too much things to consult or calculate, a question of priorities) by consulting SIMBAD Astronomical Database are welcome. Problems with names, magnitudes or adding more data like temperature, luminosity, age will be a great adition too. If you find in wiki some isolated white dwarfs, report them and they will be added too. I want also notice you that the brown dwarf binary catalog is currently incomplete due the hard work of interpretation and consulting data. I will continue with it after the fixes in the binary stars catalog. Always opened to your questions and critizism in a constructive way. I've only checked Cor Caroli because I visited the system recently and seen it was a single star instead of double, so I did a patch myself. 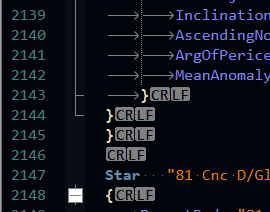 It seems the spectral class of the two components is switched. Huge work you did, all the sources too, please keep up! In line 2145 of file 'planets\BrownDwarfs-bin.sc' is a closing parenthesis too much. I have found that such parenthesis errors can sometimes cause problems with later loaded system. Thanks guys, I will check both things for the next update. Unless you find a critical error, in that case I will do a quick patch. Thats the same issue I have with 91 aqr, even a fresh install doesn't fix the issue. And... I thinks our solar system has been disappeared O_o. The catalog on this page is not for RC3 ! It is only for RC2 ! Oups I hope they work for RC3. Star "91 Aqr A/PSI1 Aqr A/HIP 114855 A/HD 219449 A"
Star "91 Aqr B/PSI1 Aqr B"
Star "91 Aqr C/PSI1 Aqr C"
StarBarycenter "91 Aqr/PSI1 Aqr/HR 8841/GL 893.2/ADS 16633"
2015 rr245 needs to be added, was just discovered. Fix for the binary pulsar PSR J0737-3039. The whole system is duplicated in 0.980 catalog with a names "PSR J0737-3039A" and "PSR J0737-3039B". The fix removes these wrong who systems and replaces with the new one: "PSR J0737-3039" with components A and B. Some extra data is added to them, including precession of the orbit periapsis (17° per year, according to Wiki). Installation is simple, as usual, - save the pak file into addons folder. "With Hipparcos, we could only analyse the 3-D structure and dynamics of stars in the Hyades, the nearest open cluster to the Sun, and measure distances for about 80 clusters up to 1600 light-years from us," says Antonella Vallenari from the Istituto Nazionale di Astrofisica (INAF) and the Astronomical Observatory of Padua, Italy.